Written for sixth form and college students, AS Law covers the content of AS Law for AQA and OCR students in a lively and reader-friendly style. Topics are broken down into manageable parts, with clear headings and are illustrated throughout with photographs, diagrams, boxes and illustrations. hints and tips for revision topics and strategies helping students to prepare for the types of questions that are most likely to come up in exams. The book contains a wealth of opportunities to test and apply knowledge, with revision quizzes, quick tests and sample questions and answers within each chapter and there are additional opportunities for self-testing and revision available via the Companion Website. This third edition has been revised and updated to take into account the new 2008 AQA specifications and contains a new chapter on contract liabilities, as well as expanded material on sentencing and court procedures. It also addresses recent legal developments such as the establishment of the Ministry of Justice, changes in the legal profession and the constitution, and the reform of the House of Lords. 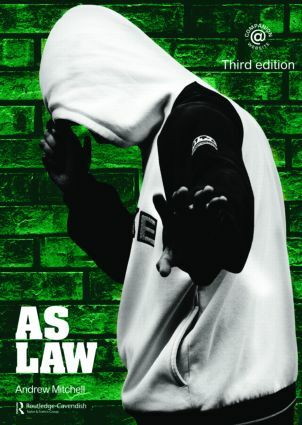 AS Law provides a stimulating and exciting approach to the subject, profiling famous legal figures and examining law in films, fiction, non-fiction and on the internet whilst offering comprehensive coverage of the AQA and OCR subject specifications fulfilling all syllabus requirements.